How can I get out of multiple advances? # 1: Balance of $20,000 with daily payments at $333 per day. Merchant has 60 business days left or approximately 3 months. #2: Balance of $10,000 with daily payments at $166 per day. Merchant has 60 days left or 3 months. #3: Balance of $5,000 with daily payments of $83 per business day. Merchant has 60 days left which equals 3 months. 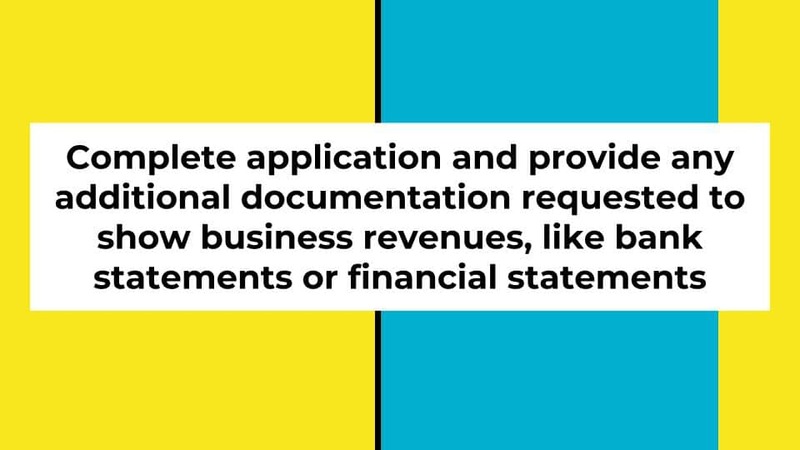 If your business has advances from stacking, complete the secure 30 second application below to rescue your business today! Get payments now you can afford that will not hurt your business, or credit or reputation. Several options to reduce your daily and weekly cash flow for advances and longer term options such as weekly and monthly payments. How you can get out of multiple advances. Add up and know your total daily, weekly and monthly payments on the advances as well as how much longer you have to pay on them. Also get your total payoff balances. Know your approximate credit score. Search for lenders that either payoff or restructure your debt as earlier options. Funding programs that recommend you close your business checking account or negotiate a settlement hurt you the most and should be your last possible options. 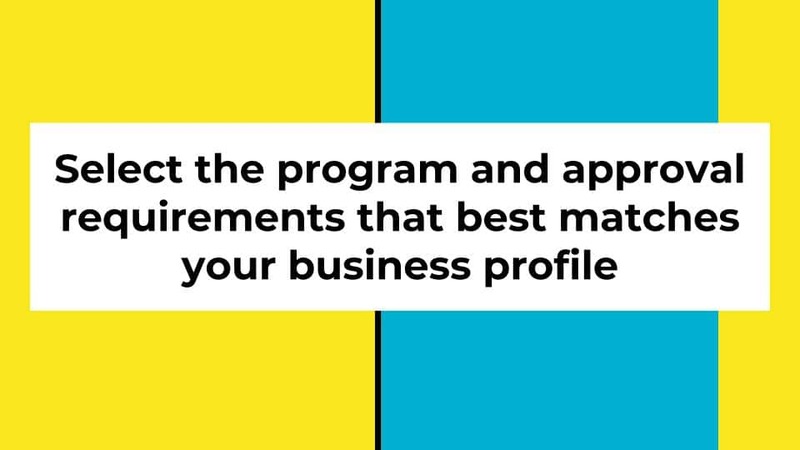 Choose a program that best matches your business profile for your amount of debt, ability to pay and urgency for a fast loan on any new program that allows you to get out of your advances. 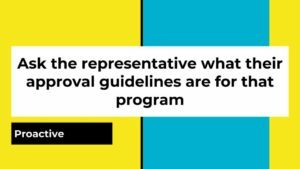 Talk to a representative of the program. Tell them about your business and ask them about their underwriting criteria. Try to assess what your chances of approval or being declined are for each program. 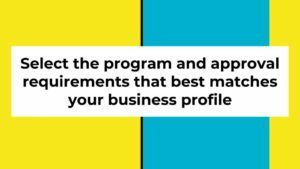 Once you find the best matching program, then apply. 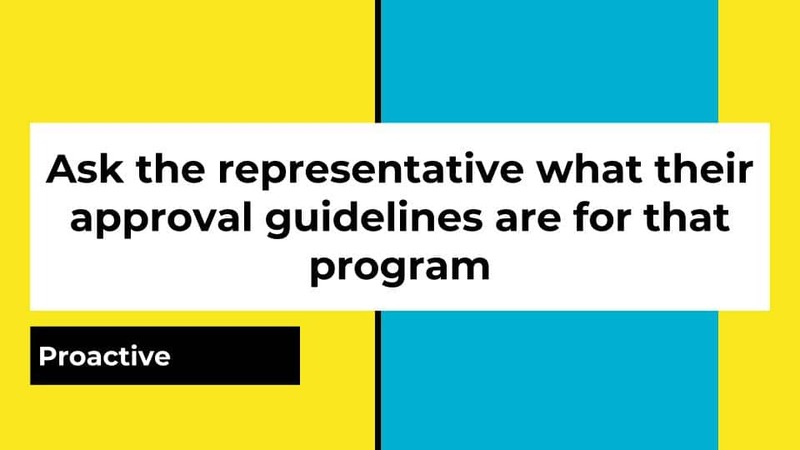 If approved, review the terms of the approval. If you are satisfied, close the transaction. Receive funds into your business account and begin repayment with improved cash flow. We have excellent programs with a high approval rate to fix your multiple mca multiple positions problem. 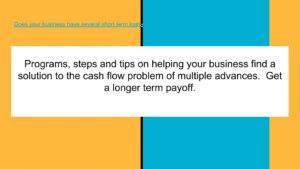 Almost all businesses can improve their cash flow. Apply above or contact us at Tel: 919-771-4177. If your business has several short term advances, contact us and get this solved today. How can I get out of these without missing payments or defaulting? You can either pay them all off through a consolidation or refinance them and extend the term several more months. You may qualify to extend the term for up to 10 years. How much lower can you get my Payment? I need to reduce my payment by half or more. Can you do that? We have programs available that can reduce your payment between approximately a third to more than half. In some cases your payment can be lowered as much as two thirds. There are links to several other financing options below and also helpful articles. Review funding program details below. We offer free consultation because we want your business to succeed. Once approved, verify closing terms and conditions. Provide required items. Complete transaction and receive funding. 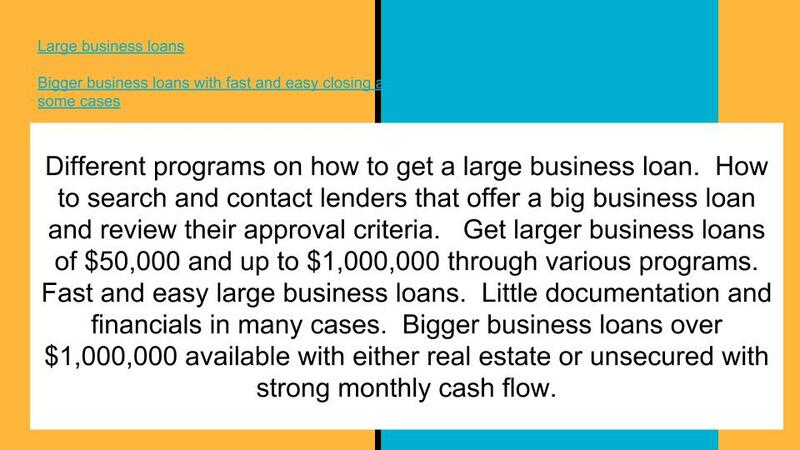 Large business loans. Fast and easy with minimal paperwork in many cases. FAQ Frequently asked questions for a large business loan. 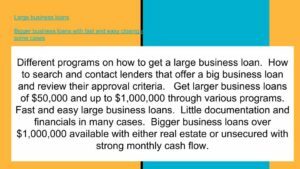 How can we qualify for a larger business loan? 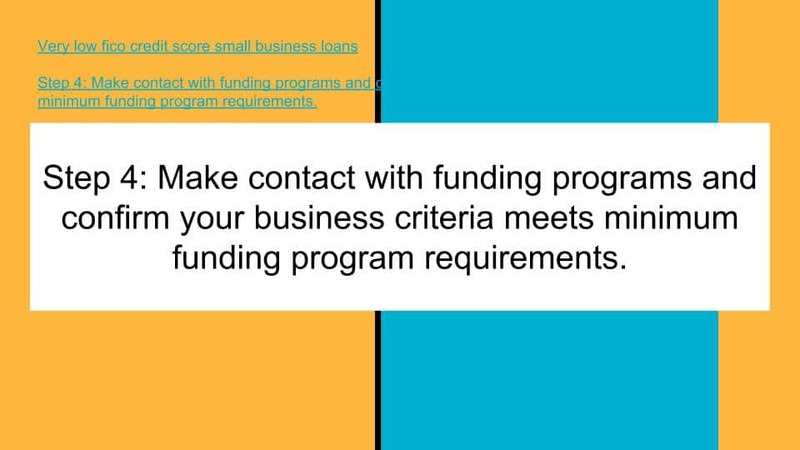 Businesses that have revenues over $50000 per month with credit scores over 600 and time in business over 1 year may qualify for a larger business loan. The higher the average bank balances or average daily balance the more your business can qualify for. Do we need to provide more financial information to get higher amounts? For amounts over $250000 more financial information may be required. This can include the most recent years business tax returns and interim financial statements. How many months bank statements do you need? Between 3 and 12 months of the most recent business checking account statements are needed. We are a startup business. 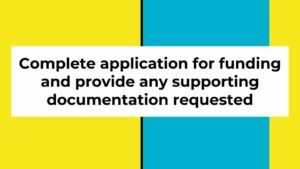 Can we get a higher amount for a business loan as a start up? A start up can get large business funding amounts if they have had significant revenue in the first few months of operation. The business will need to have been operating and generating significant revenue for at least three 3 months. Our business will keep needing higher amounts of business funding in the future. Can we use this like a business line of credit? yes. When the business pays the balance down to 50% or more it may qualify for more funding immediately. 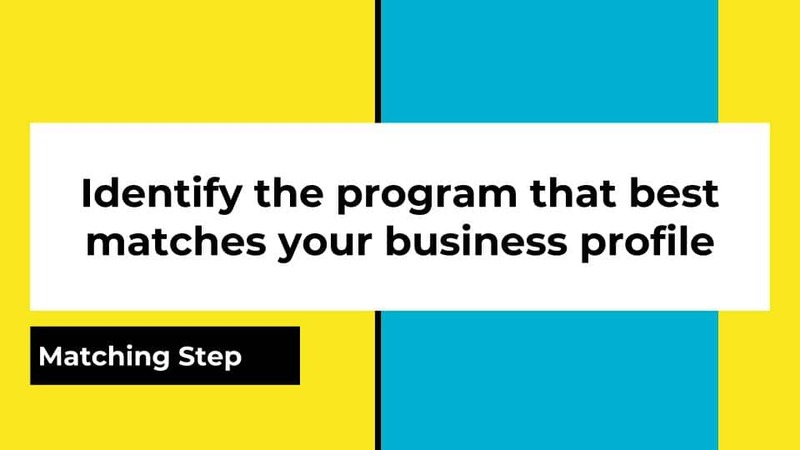 Programs are available that allow businesses to draw funds after every 30 days of repayment. 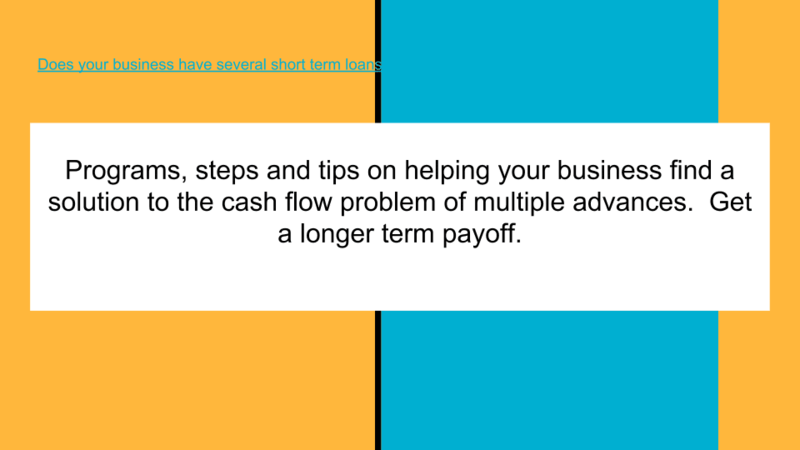 Do larger business loans take longer to close? Larger business loans often do not take any longer than smaller business loans to close. the repayment will be based on the cash flow of the business so most of the same information is reviewed. Will Real estate and other assets be required? Real Estate is not required but it may allow for an approval and a higher approval amount. Most businesses take the maximum they qualify for without involving real estate or their other assets. We filed an extension and do not have the most recent business tax return available yet. Will this be a problem? amounts less than $100000 do not require a tax return in most cases. Amounts over $100,000 may require the most recent tax return. What are the main reasons businesses are declined for a larger business loan? The main reasons are low business revenues as well as very low credit scores and a short time in business. My business partner has very bad credit. Will that keep us from getting a larger business loan? Business owners with bad credit that have less than 20% ownership should not cause a decline. over 50% ownership percentage may cause a lower approval amount or a decline of the request. Can we get a big business loan with a month repayment? Yes. monthly and weekly repayment business loans are also available for larger business loans and may be up to 36 months or longer. “I cannot pay my mca merchant cash advance.” I missed payments and am behind on payments on my mca merchant cash advance and business loan. What can I do? 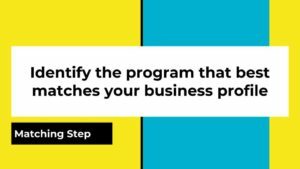 There are several steps you can take when you are behind on your mca merchant cash advance payments, or your business loan or personal loan is past due. These steps and others can or make it much less severe. One step is to payoff the past due loan by refinancing. Contact us below for help on how to fix missed payments on a mca merchant cash advance or business loan you have missed payments on, or cannot pay any more on. 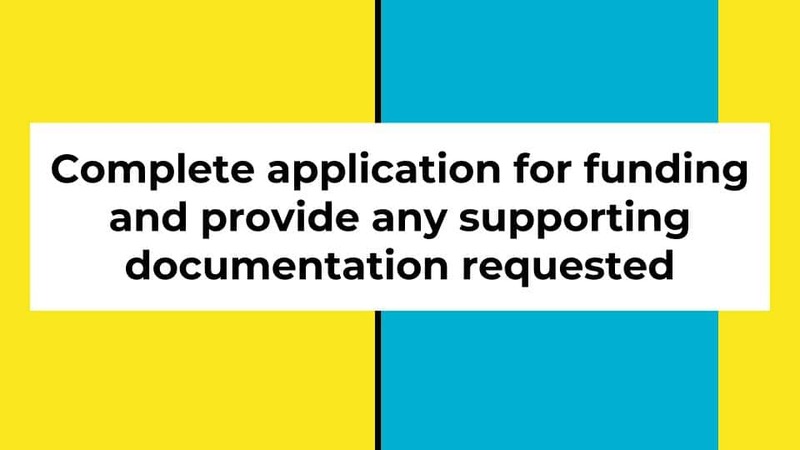 Secure DocuSign 30 Second Application here. 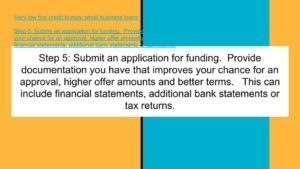 How to fix missed payments on a mca merchant cash advance or business loan and what to do when you are behind. Step 1 Contact the lender. Let them know you are having trouble paying the advance or loan. Be prepared to answer why you cannot pay it and how you will plan to catch up. Step 2 Ask the lender to work with you. 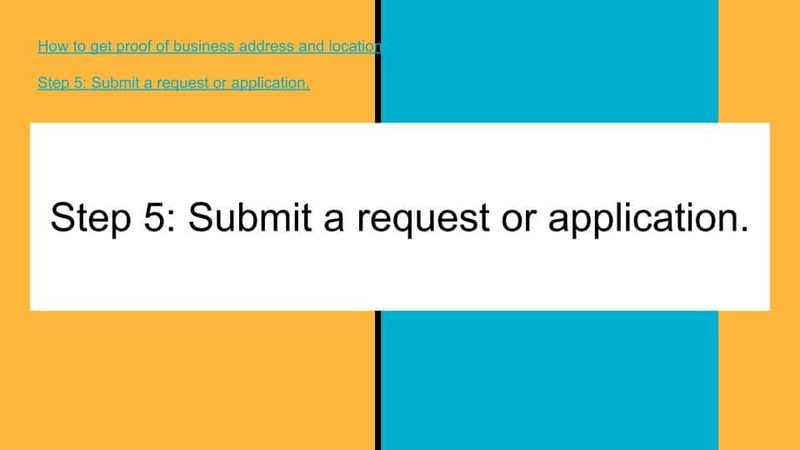 Ask for lowered payments or suspended payments. If they refuse ask them to offer you a plan for payments you can handle. Determine in advance what you are able to pay. Tell the lender what you can pay and ask them to set up a payment plan for that. Step 3 Follow through on your agreement. 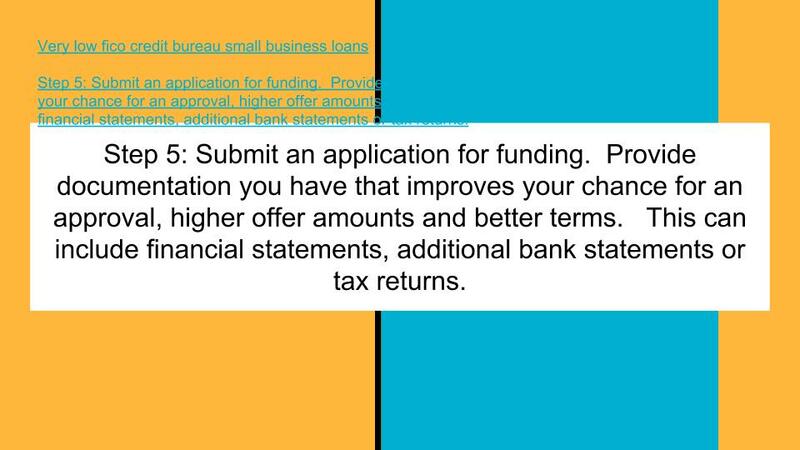 Step 4 *How to Tip: If you will not be able to continue paying the cash advance or business loan, ask the lender for options. 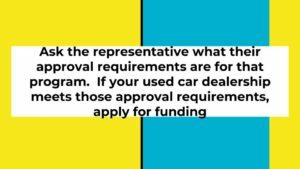 There are often options available just by asking for help or letting the letting know you cannot continue to make the payments. I missed payments and am behind on my mca merchant cash advance and business loan. Here is how to fix it. What if you cannot pay the cash advance or business loan and cannot catch it up? If you cannot continue paying the cash advance or business loan, ask the lender what the options are. For mortgage loans, many lenders have excellent options for assisting past due borrowers. 1. Pay a settlement on the mca merchant cash advance or business loan. If you consider this option, negotiate hard with the lender on how this will be reported on your credit. You want to push for the best possible credit bureau reporting of this event. If the lender reports the tradeline as “settled for less than full balance”, this may be the best reporting. This is another excellent option if you can qualify. 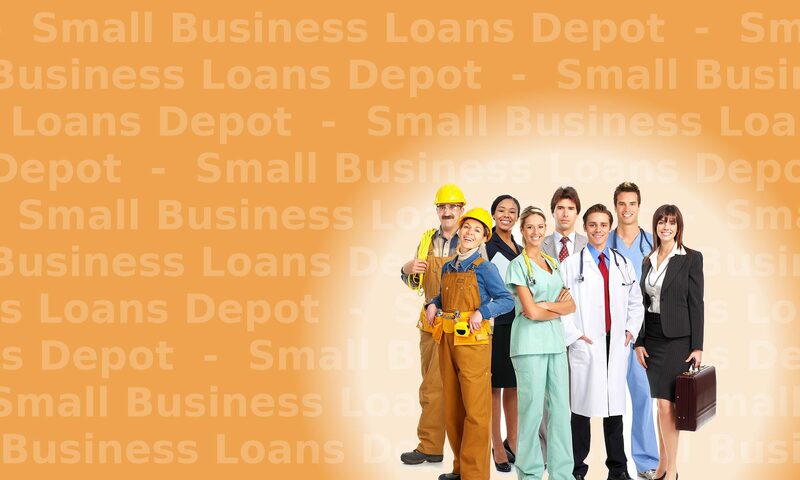 Payoff the cash advance or business loan with another loan. This works well if the balance of the loan you are past due on is low. If your current past due loan has not damaged your credit too much yet, this option may work. 3. Another option is to ask your current lender to modify the loan. Your current loan is $500 per month and was for 48 months. You have 10 months left. Ask the lender to modify the mca cash advance or loan for a lower payment and for more months. In this case, ask them to lower it to $200 to $300 per month for 20 and 25 months. Tell them this benefits both them and you. You will have a payment you can make and their loan will also be paid. Some lenders do not want to modify. If you can demonstrate to them that you will be able to pay the past due business loan by getting a lower payment, they may agree to it. Prepare a Quarterly or Monthly Profit & Loss statement to show the lender that you cannot pay now, however if they lower it, your budget will allow for their payment. 4. Take another hard look at all of your current expenses. Can you easily reduce expenses somewhere else? Are there services that you are paying for that you really do not need and can cut? This can include business expenses and personal expenses. 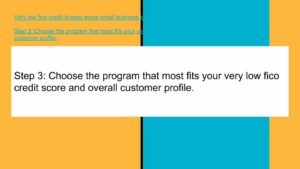 Question: I am behind on a merchant cash advance. How can I get out of it or get help? What other loan types can I get to payoff the mca merchant cash advance and business loan I am behind on? There are many options. The most common types are below. “My mca cash advance company threatened me with a coj certificate of judgement.” What can I do? Talk to the merchant cash advance company as much as it takes to make sure they do not file a coj in court. This can clean out your accounts. It is not too late. Talk to the lender about every possible solution. Show you are proactive in trying to reach a solution. You do not want them to file a certificate of judgement. Other requests and needs: “I cannot catch up my cash advance. I am too far behind”. I have to stop paying my merchant cash advance. When these things happen, review any settlement possibilities and also the refinance options above. 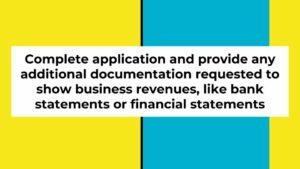 Accounts receivables financing is another way to increase the cash flow you need to pay your current past due merchant cash advance or business loan. This can give you cash now which may be enough to pay the payments you missed and are behind on. 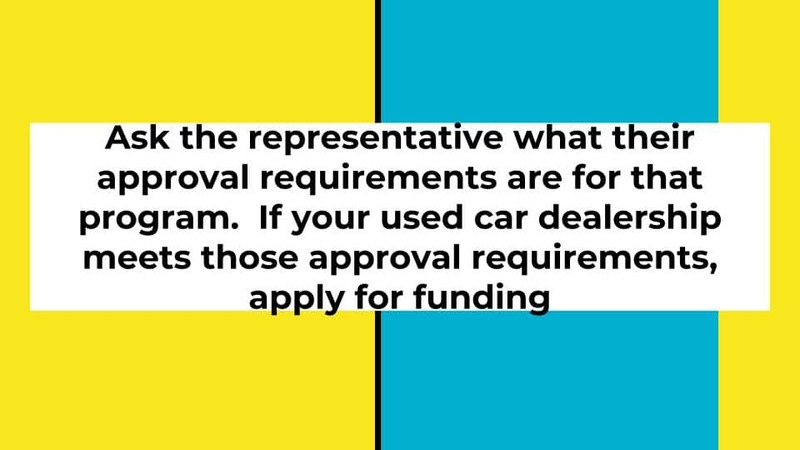 This includes a loan against equipment. Funding is between 24 and 42 months and includes a monthly payment. Earth moving equipment, Yellow Iron and “over the road” OTR rigs, semi-trucks are usually accepted.